Who Are We? 2019 will reflect back on previous programmes in 2017 and 2018 focusing on ‘exchange’ and ‘production’ to guide us seamlessly into the 2019 thematic of ‘movement’. It’s a comfortable thematic for us since one of the central drivers of the ‘Who Are We’ programme at Tate Exchange has been migration and displacement, specifically seen through the lens of artists who have experienced the lived realities of displacement and/or choose to explore migration as an everyday norm. 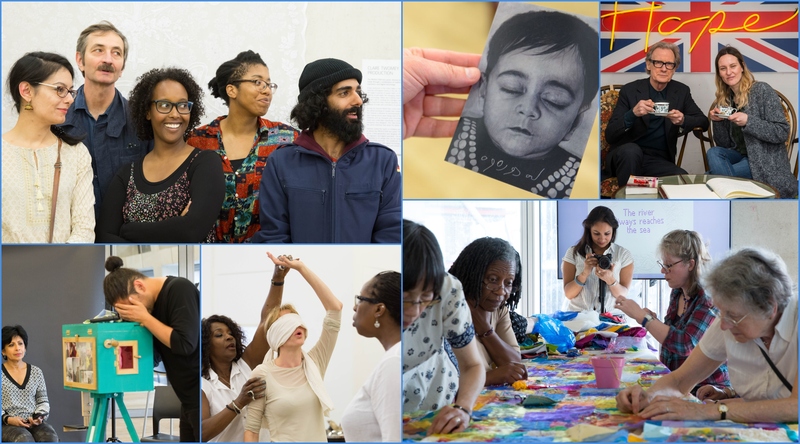 Our programme in May 2019 will, as before, choreograph conversations with artists, cultural activists, academics and cultural hubs both in and outside London to explore the movement of people, place and power. We will again ask the perennial and perhaps ever more provocative question of ‘Who Are We?’ – with emphasis on artists’ rights and freedom of expression alongside a whole host of installations, gatherings and interventions around the politics of education, cooperative commissioning and equal access. We look forward to continuing our collaboration with the Tate Neighbours group – first born via Tania Bruguera’s Hyundai Turbine Hall Commission; and Tate Exchange Associate, the Plymouth College of Art alongside the Stuart Hall Foundation and many more. The 2019 programme is currently being hatched so watch this space for further editions and new parts of the programming puzzle.